(CNN) -- Rio's Olympic bid coup on Friday may have the lyrics to "Copacabana" playing on a loop in your head, but it's still too early to squeeze into a Brazilian bikini -- you can't even book a flight to the 2012 Olympic Games in London yet. 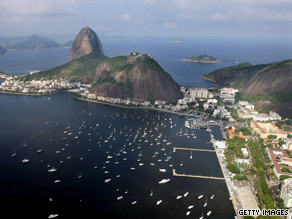 Rio de Janeiro beat out Chicago, Madrid and Tokyo for the 2016 Olympics. Travel experts said the flame has to go out in one city before moving on to the next. The Winter Olympic games haven't yet begun in Vancouver, so if you're thinking about a trip to London's July 2012 Olympics start looking for deals as early as next year, and for Rio, you'll have to wait until 2014. "We anticipate that we'll have packages for London by April of next year," said Don Williams, vice president of sales and marketing at tour operator Cartan Tours. "The demand in London will be pretty good because of location, and we'll be price sensitive because it is an expensive city." As for individual event tickets for the London games, merchandise isn't expected until 2011, said Jet Set Sports president Mark Lewis. Jet Set Sports and its partnering wholesalers sell the tickets in phases, Lewis said, starting about 18 months before the Games' start date. For the best selection, sign up for e-mail alerts so you can pre-register in late Spring and the company will send you an email when tickets are available for purchase. Jet Set Sports also offers packages that include accomodations with event tickets. Tour companies, on the other hand, place airfare, accommodations for four to five nights, tickets to select events, transportation and translation services, plus a few meals into one neat -- and more expensive -- package. Many also offer extension tours to other spots in the region, so you can fit in sightseeing as well. Cartan Tours is offering pre-reservations for the London Games for those who are dead set on being in London in July 2012. By signing up and plunking down a refundable $250, you can be one of the first to select a travel package, which vary in cost depending on length of stay, airfare and hotel. Packages for Beijing ranged from $4,000 to more than $9,000, and Williams said there's always an initial rush to purchase as soon as flights and tickets to the host city become available. So if you're so intent on the Olympics that you've already planned your vacation days, definitely start researching now, said Sports Traveler owner Anbritt Stengele, who is also pre-reserving customers for 2012 London trips. "The reason why we started so early is because we had a huge interest in London," Stengele said. "I thought that 2010 in Vancouver would be a huge interest for people, but coming right off the Summer Olympics in Beijing, we already had people asking us what we could do for 2012. The response has been very strong, and Beijing did us some favors by putting on a tremendous show, so the Olympics is looking very appealing." There's been so much interest, Stengele had to limit the number of early reservations. "We had close to 400 people for Beijing, and we brought over a lot of staff and we hired a lot of people on site for translators. Unfortunately, there's only so many people that our company can travel. [For London] we will have to limit it, because there's a limited amount of hotel rooms and transportation." Accommodations in Rio are already causing concern for the tour operators, despite the fact that hotels in the area, like the Windsor and Sheraton, have barely begun planning for what is sure to be an astronomically large event. "We look at the city and see what accomodations are available," Williams said. "In Beijing, bed and breakfasts weren't an option. But London will have plenty of options -- it has the most out of any city I've worked on. [But] I think Rio is going to be a challenge because there are fewer hotels in Rio than London or Beijing; it'll be a challenge to get adequate accommodations for the event sponsors and the public." It's also a concern for Stengele, who's hoping the 2014 World Cup will help prepare the city for the 2016 Olympics. "With London, we have options in surrounding areas," she said. "But in Rio, there are a lot of areas that are very rundown; I'd be concerned with people booking on their own to book in a place that's not safe. But we do have the World Cup in 2014, so maybe by 2016 there'll be more hotels." Vic Walia, a spokesperson with Hotels.com, isn't concerned about a lack of accomodations, but does want the London or Rio-bound to know that they'll have to contain their excitement for a few more years. "With London, right now we're only taking stuff through October 2010," Walia said, adding that Rio bookings are a long, long way off. "But," he said, "we do have inventory in Rio now and we have an office in Brazil, and we're always adding new hotels to our network. By the time 2016 would rolls around, our hotel network should expand." Similarly, airlines don't sell airfare to either host city until about 11 months beforehand -- for flights to London for July, 2012, start looking around June of 2011. But for Rio, you won't be able to book until 2015 at the earliest. Nonetheless, Stengele said, "the flight is crucial. There aren't a lot of options for Rio. I'm hoping because of the Olympics and the World Cup, they'll have to open up more air flights, because with fewer flights, that's how the cost skyrockets." Tim Smith, an American Airlines representative, said there isn't a plan to create new flights to the region just yet. "Generally, that would be done fairly close-in to the event," Smith said. "We watch the volume of bookings as they come in and the timing of the travel requests and then add additional flights on specific days and times as necessary." However, he added that "it seems safe to predict we will likely add flights on certain days given our large presence in the Brazil market." Bottom line? Sit tight, sign up for ticket email alerts and go ahead and spring for that Brazilian wax -- even if you are about six years early.